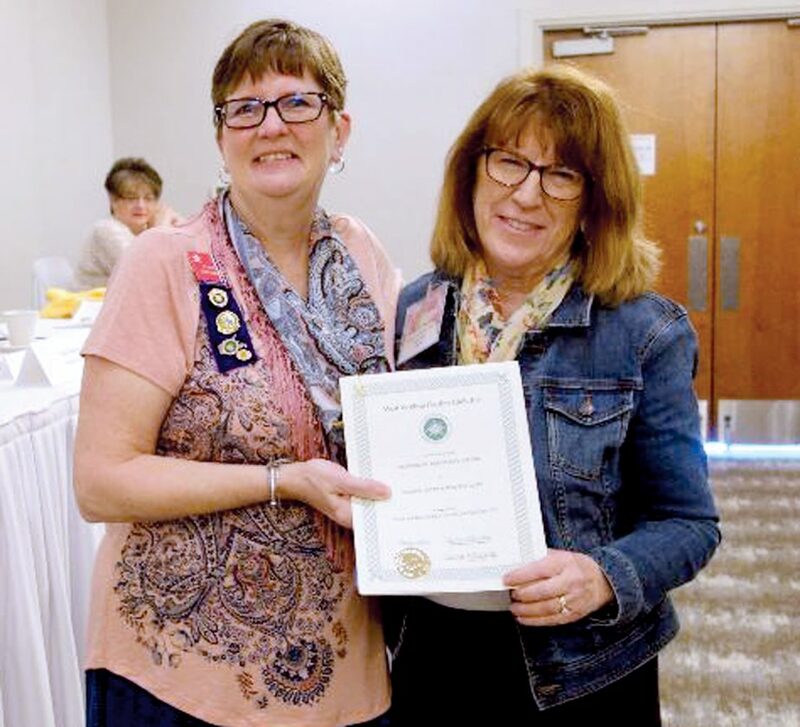 Submitted photos ESGC president Pat Mayes accepts five awards for her club from Carolyn S. McCafferty, WV Garden Club president. ELKINS — Exciting news was announced at the April meeting of the ESGC while members and a guest had the opportunity to learn about various aspects of weather from club member, engineer and pilot Ken Hanscom. Hanscom possesses a special interest in Aviation Science and was involved as a radar technician for the Navy taking weather measurements, ocean temperature and other data while flying inside Hurricanes. Later he flew AH-1Attack Helicopter for the Army. He is a current FAA Certified Flight Instructor specializing in teaching instrument weather flying and has been awarded the FAA’s Master Pilot Award for over 50 years of accident free flying and dedication to the field. Hanscom. 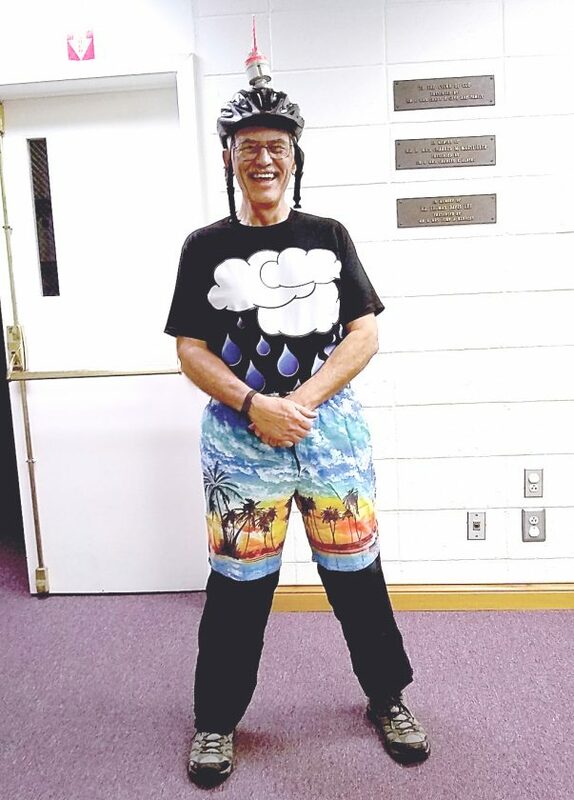 used the elements of humor and surprise leading members through topics related to weather, climate, cloud formations and provided a slide show creating virtual travel through the atmosphere through ascending altitudes. Measurements of temperature, barometric pressure, humidity and wind was discussed along with instrumentation to achieve such measurements. The rotation of the Earth was demonstrated and the various weather cells were described. Weather forecasting data was shown with good reliability for a five -day forecast. Members were told that forecasts beyond the five-day period is, most likely, just an educated hunch based on all collection techniques available to the meteorologist. Cleverly worded quizzes, jokes and audience involvement made the presentation of such serious scientific facts entertaining. Following the program, members Dianne DeMotto and Christina Sanders served colorful foods and pastries using a spring motif of pink, green and yellow before leading into the regular club business. ESGC member Ken Hanscom, alias Professor Von Storm, presents program to local members. ESGC received five awards during the WVGC Convention, Holiday Inn, Martinsburg on March 23-25. Those received were: Yearbook Award for Outstanding Yearbook for a club membership of 25-plus. Yearbook created by Pat Mayes, president. Publicity Pressbook, first place for a medium size club. Pressbook compiled by Judy Guye Swanson. Ashworth Arbor Day Award for two Arbor Day events in Elkins in 2018 organized by Katy McClane. Award for article on gardening, Keeping In Touch, submitted by Katy McClane and printed inWest Virginia Garden News, May 2018. The Junior, Intermediate or High School Gardening Honor Award for the Elkins Mountains School Horticulture Design Club, Bobbi Trimboli, classroom project organizer and Katy McClane, on-site landscape instructor. High School Gardeners Award, first place ribbon, for the same club for involvement in the various activities presented by ESGC with club members Trimboli and McClane in leadership roles. Davis Memorial Presbyterian Church After School students were winners of the statewide poetry contest sponsored by the West Virginia State Garden Club. five students won state awards while three went on to win the South Atlantic Region of the National Garden Club. Inc. Award. Elkins resident Legacy Skout Barger won a $3,000 scholarship from the West Virginia State Garden Club this year. Planning continues with the designated committee for the Serenity Garden which is a joint project of ESGC and Davis Medical Center. Katy McClane announced the following 2019 Arbor Day events: On April 26, ESGC and the Elkins Tree Board have organized two events. At 1:30 p.m., the Elkins Middle School will host a tree planting at the school. The ESGC will be assisted by Scouts of America and the Make It Shine Club placing a tree in honor of Connie Lou Pingley Farlow, the late daughter of ESGC member Rachel Pingley. At 3 p.m., on the same day, Davis & Elkins College will host an event where an American chestnut will be planted near the Morrison-Novakovic Center on lower campus in honor of Joe Tekel, a forester and member of the Tree Board, who passed away July 2018. Mayor Van Broughton will read the Arbor Day Proclamation. All interested parties shall assemble at the gymnasium parking lot. The public is invited to both events. It was decided to purchase mulch for the garden behind City Hall. It was decided to send a donation of $50 to the The West Virginia Land Trust for the Bickle Knob project. Mountain Schools will have a class in April about snakes and their importance in ecology with Jim Fregonara from the DNR. A May class will be lead by ESGC members Donna Isner and JoAnn Gabel about gardening in a hay bale. The landscape program will be given an added dimension this year by providing awards to students who finish 10-hour blocks of gardening on their campus and in community gardens. Certificates will be given to students to take with them when they exit the school. The program will be titled the Landscape Apprentice Project. It was announced that the House and Garden Tour of Historic Berkeley and Jefferson Counties is on April 27-28 sponsored by the Shenandoah-Potomac Garden Council. The next meeting will be Food, Floral and Fun VI which will be held on May 18 from 9 a.m. to 2 p.m. at the Randolph Community Arts Center where plants, bazaar items and fresh baked goods will be for sale. Proceeds benefit garden club community projects. The public is encouraged to come to buy plants for their gardens, specialty items and a sweet treat or two for very reasonable prices. Anyone interested in any of the programs or becoming a perspective member of ESGC is encouraged to contact BJ McKenzie at 304-614-3079.